Wow! The last few days have been absolutely incredible. I have to give a very big THANK YOU to Apartment Therapy for the beautiful post about the new Dreamland Collection. We were also on Re-Nest, AT’s green home site! Kristen Lubbe wrote this fantastic article, and she is one of the many incredible people you can meet at our launch party on October 10th. Ok, now I am exhausted! I am going to spend the weekend in LA playing with my god-daughter and celebrating this wonderful new phase in my life. And of course I’ll be back on Monday with lots of new design treats. https://www.aphrochic.com/wp-content/uploads/2017/02/Aphrochic-logo-glow-700.png 0 0 Jeanine Hays https://www.aphrochic.com/wp-content/uploads/2017/02/Aphrochic-logo-glow-700.png Jeanine Hays2009-10-02 19:52:002009-10-02 19:52:00THANK YOU!!! Congrats on your Apt. Therapy feature! Congratulations – looking forward to seeing more of your work!!! Blessings. congrats! they are lovely, i have to feature these on mochatini. So happy for you! huge congrats on your shop, it looks fabulous! you are too cute! wow – really great! wishing you tons of goodness. And the good vibes keep on coming. Thank you all! 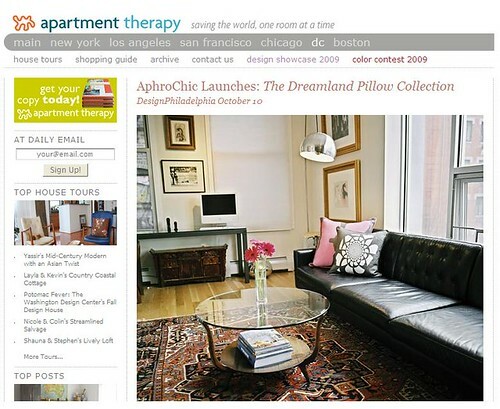 AphroChicShop.com: Life Is But A Dream… Room & Board Los Angeles!